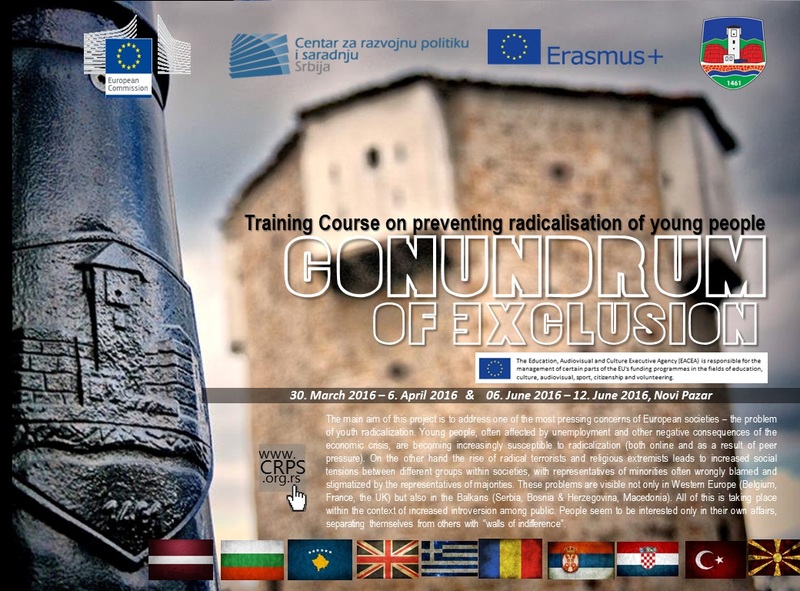 Centre for Development Policy and Co-operation invites young people from Serbia, United Kingdom, Bulgaria, Macedonia, Romania, Croatian, Greece, Turkey, Kosovo*1244, and Latvia to apply for participation in the program Conundrum of Exclusion – Training Course on preventing radicalization of young people , which will be held in Novi Pazar in Serbia. The main aim of this project is to address one of the most pressing concerns of European societies – the problem of youth radicalization. Young people, often affected by unemployment and other negative consequences of the economic crisis, are becoming increasingly susceptible to radicalization (both online and as a result of peer pressure). On the other hand the rise of radical terrorists and religious extremists leads to increased social tensions between different groups within societies, with representatives of minorities often wrongly blamed and stigmatized by the representatives of majorities. These problems are visible not only in Western Europe (Belgium, France, the UK) but also in the Balkans (Serbia, Bosnia & Herzegovina, Macedonia). All of this is taking place within the context of increased introversion among public. People seem to be interested only in their own affairs, separating themselves from others with “walls of indifference”. In our project we want to address these challenges by deconstructing the existing problems, promoting educational solutions and fostering strategic cooperation between youth organisations and public authorities. – to facilitate cooperation between youth organisations and local authorities, as well as representatives of business. The venue of the project – Novi Pazar in South Serbia, inhibited by people representing all four major monotheistic religions – will provide an additional educational dimension. The short-term impact of the course will be on its participants, who will receive the necessary competencies in various youth empowerment and radicalization-prevention strategies. In the long-term we expect to see future activities resulting from co-operation between our participants (we will facilitate special sessions devoted to future projects). The methods will include non-formal methodology based workshops on youth inclusion, social cohesion and entrepreneurship; case studies of strategies and examples of activities aimed at de-radicalization (e.g. UK strategy called Chanel); discussions and meetings with representatives of local authorities and businesses. Both trainers are experienced in youth work (with specific Balkans expertise), both are members of the Council of Europe’s Pool of Trainers. Partners and travel cost limits: Bulgaria €275, Lativia €275, United Kingdom €275, Turkey €275, Greece €275, Croatia €180, Romania €180, Macedonia €180, Kosovo*1244 €180. If you want to receive our youth activities and the “liking” us HERE! Your CRPS!